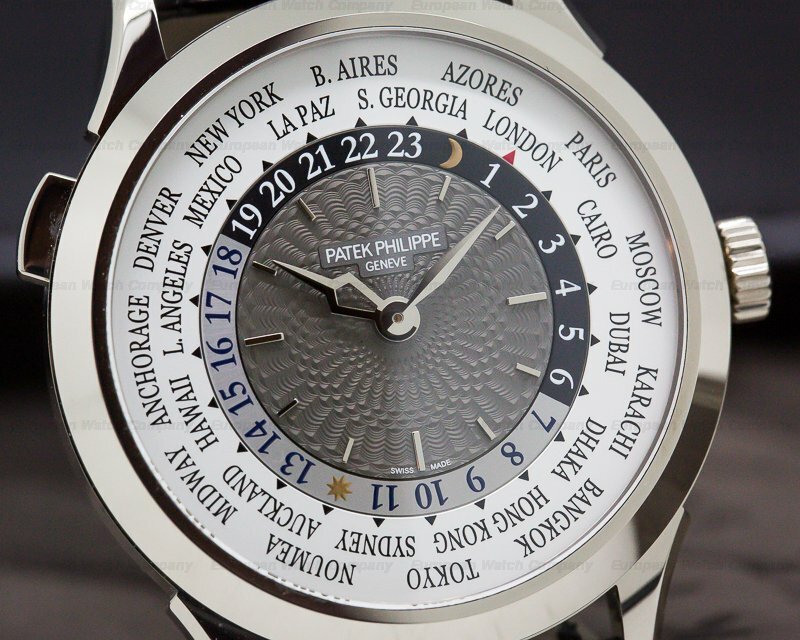 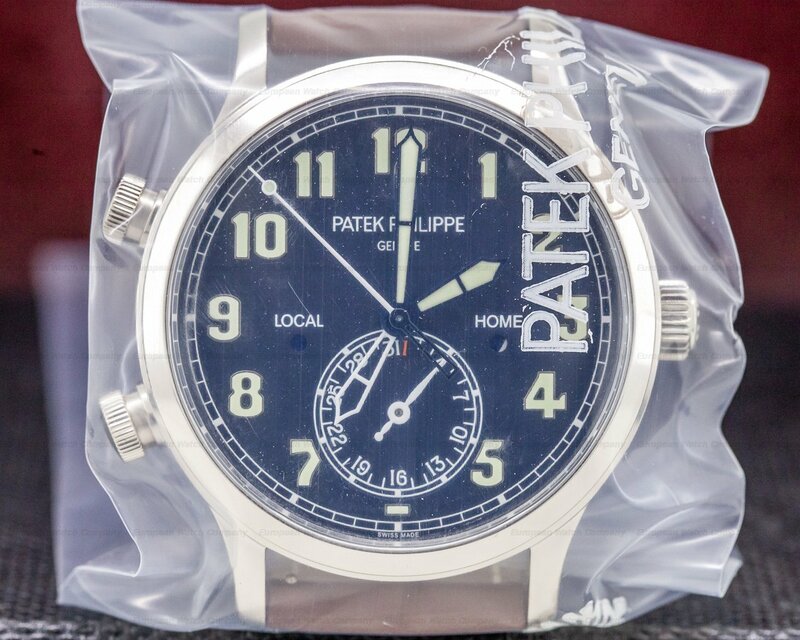 This is an 18k white gold Patek Philippe World Time 5230G-001. 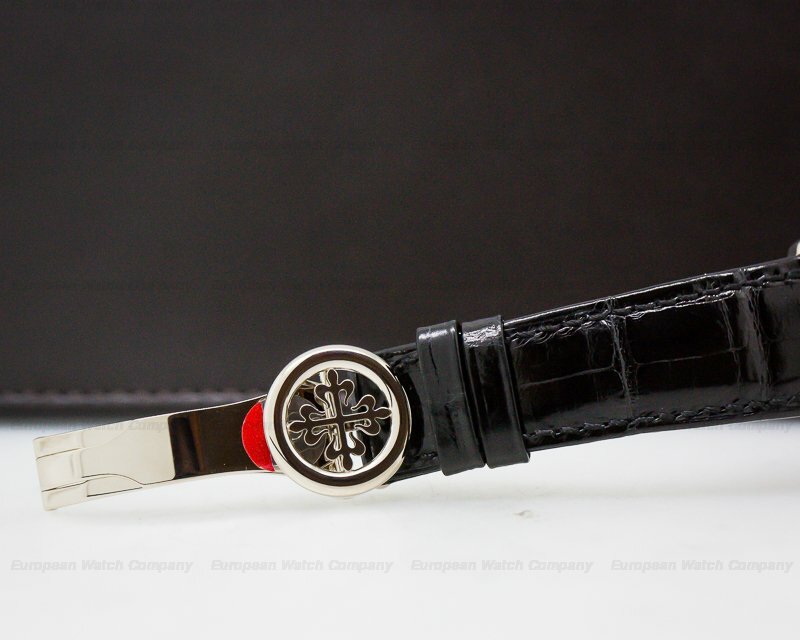 It has a hand stitched square scale Alligator leather strap with a white gold double foldover deployant clasp, and a scratch resistant sapphire crystal. 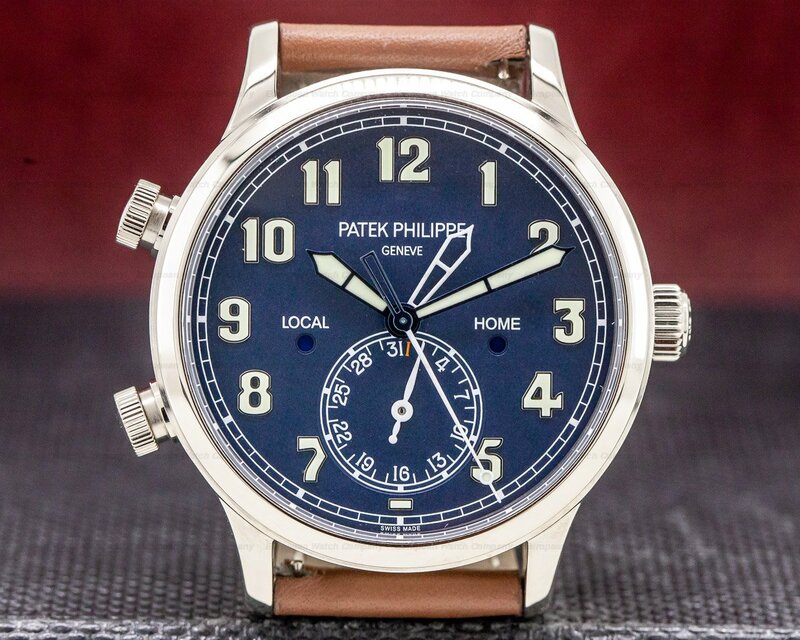 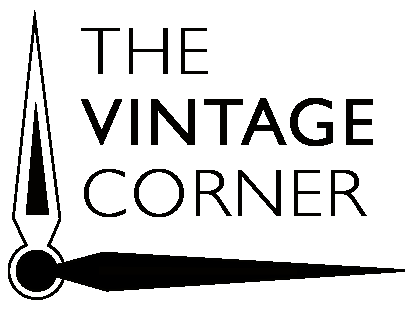 There is a rectangular push button at 10 o'clock for the updated modern city/time zone ring, a two-position pull out winding crown, and a snap on exhibition sapphire display beveled case back. 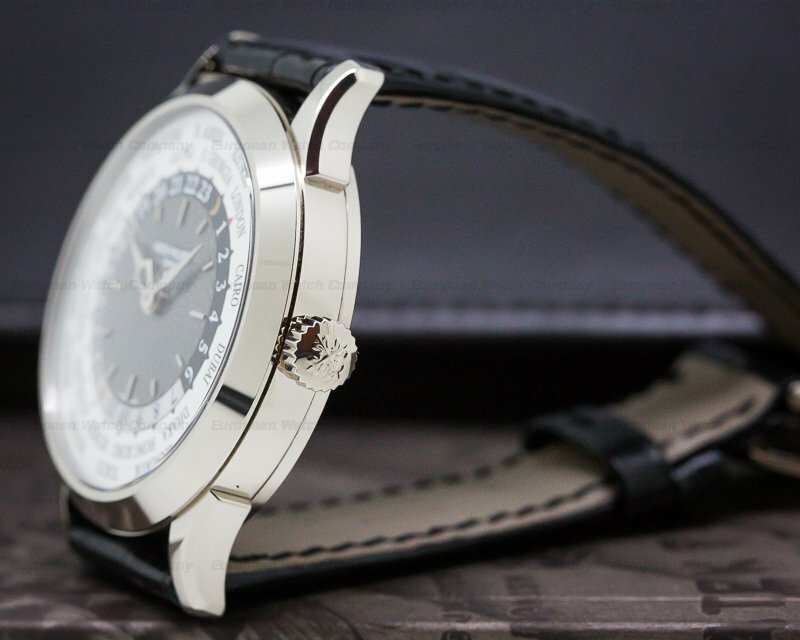 The 38.5mm diameter solid three-body case, curved faceted lugs, and flat angled bezel are polished. 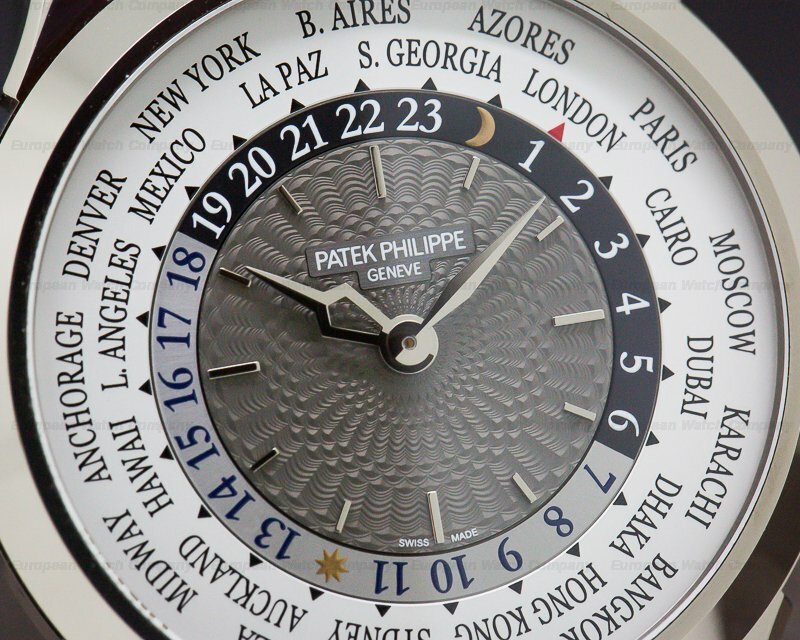 The center of the dial is charcoal gray lacquered with concentric hand-guilloche historical basket-weave texture, white gold applied baton hour markers, and white gold luminous dauphine hands with lapped flanks, with the skeletonized hour hand in the shape of the Southern cross constellation. 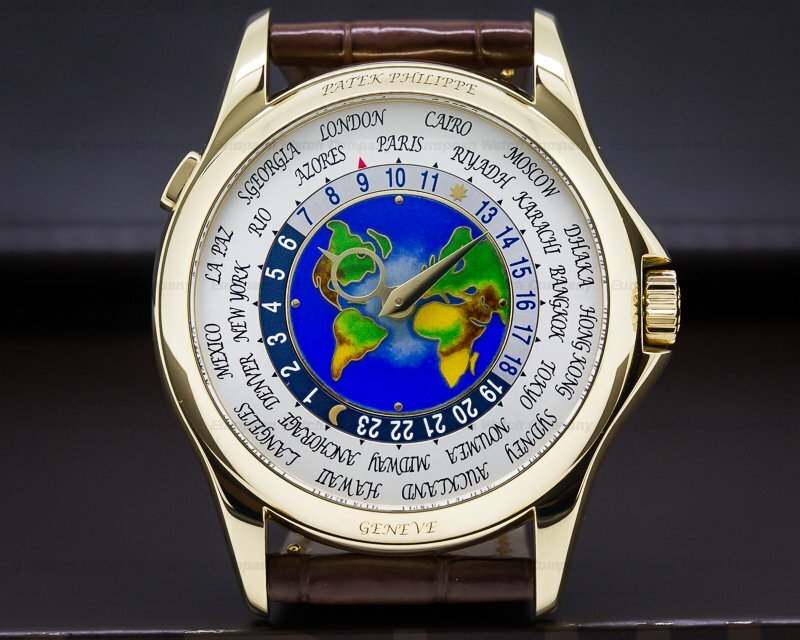 It has an outer night/day 24-hour GMT ring with a gold crescent moon at the 24-hour position, a yellow gold sun emblem at the 12, and a red indicator triangle for the 24 different time zones/cities on a white outermost reserve. 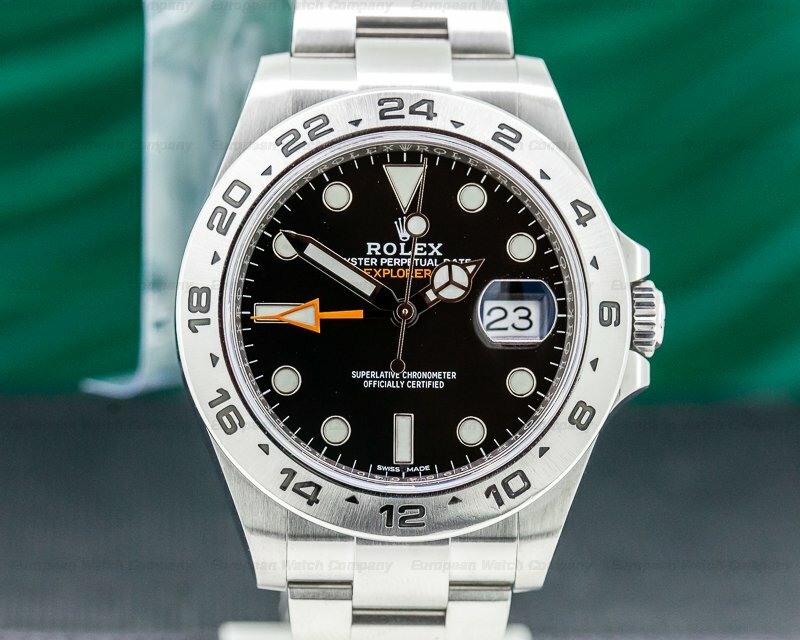 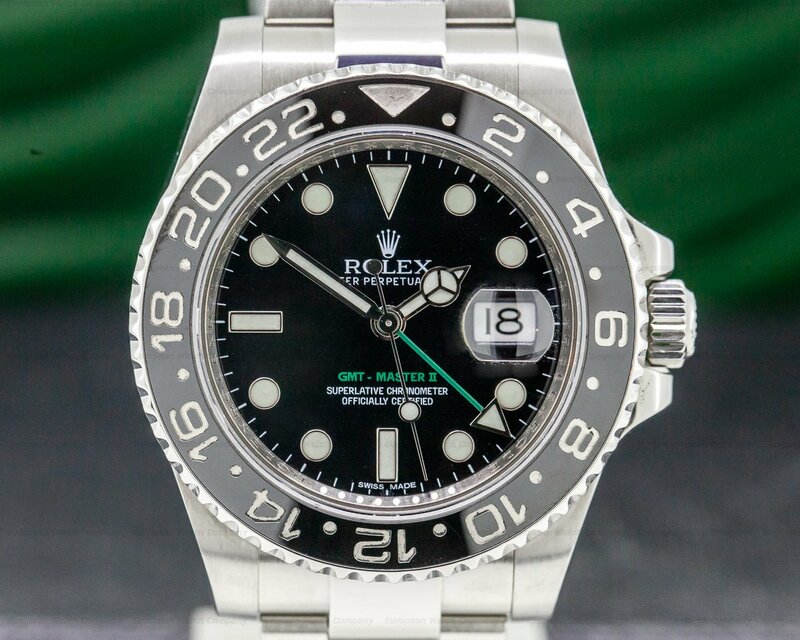 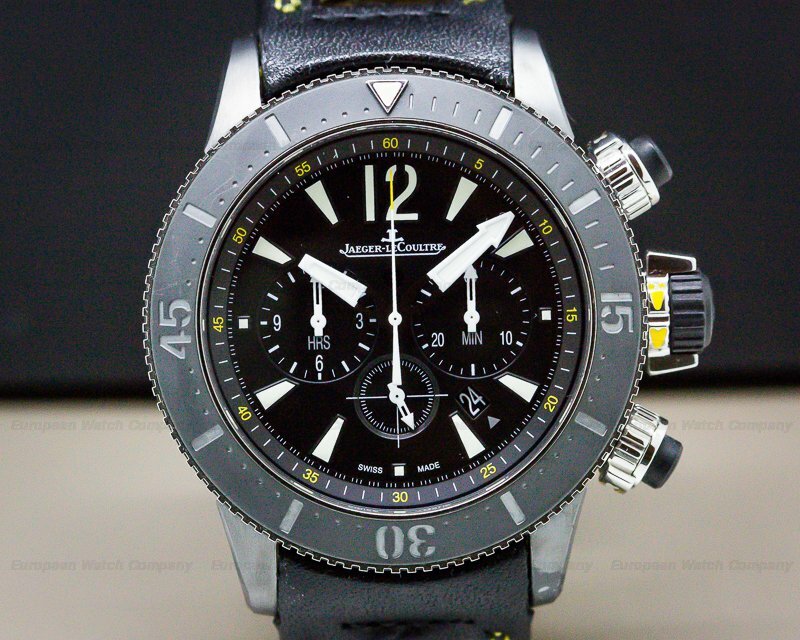 It has a minimum power reserve of 48-hours, and it's water resistant to 30 meters/100 feet. 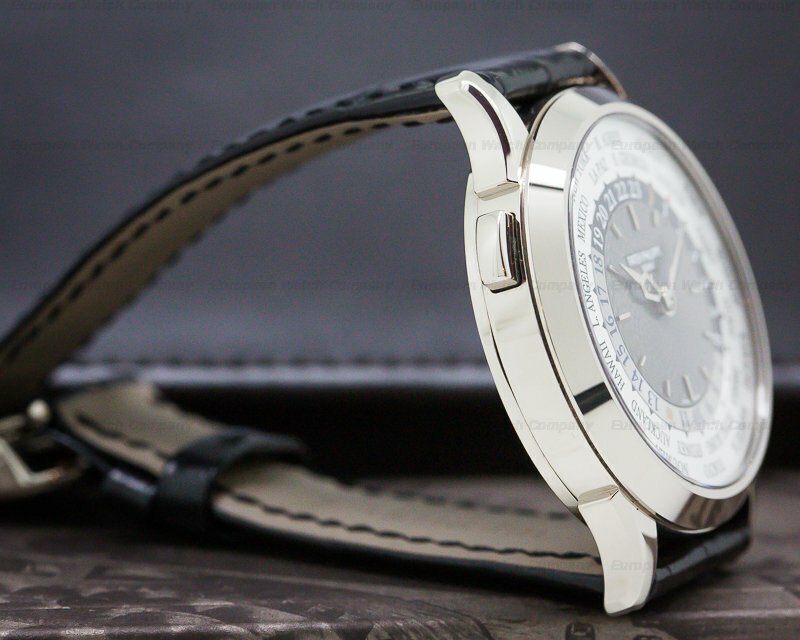 The 10.23mm thick case, dial, and movement are all signed. 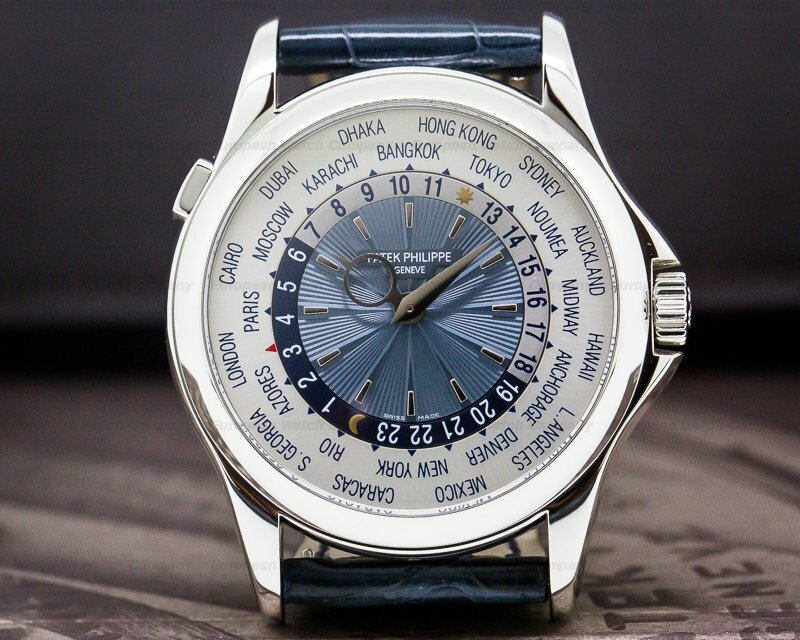 This Patek Philippe World Time 5230G-001 has a mechanical automatic self-winding Patek Philippe caliber 240 HU movement (HU stands for Heure Universelle, or universal time). 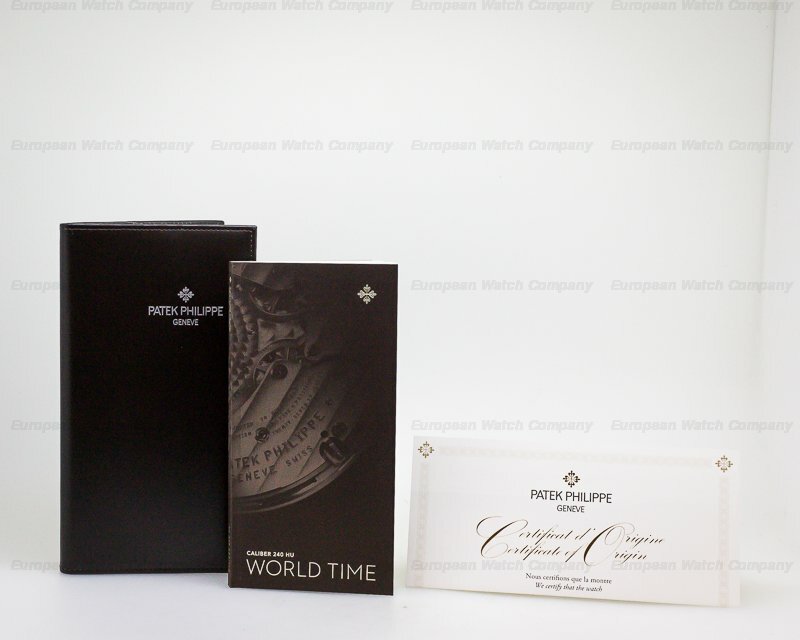 It's rhodium plated with Cotes de Geneve embellishment, and the bridges are chamfered and are decorated with Geneva waves and gold-filled engravings. 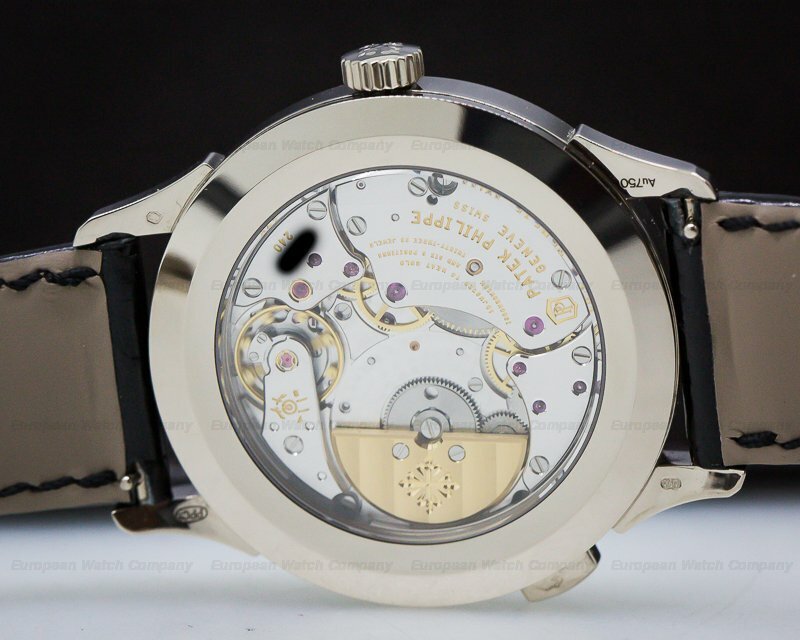 The mainplate has hand perlage, and the gilt brass wheels are countersunk with chamfered spokes. 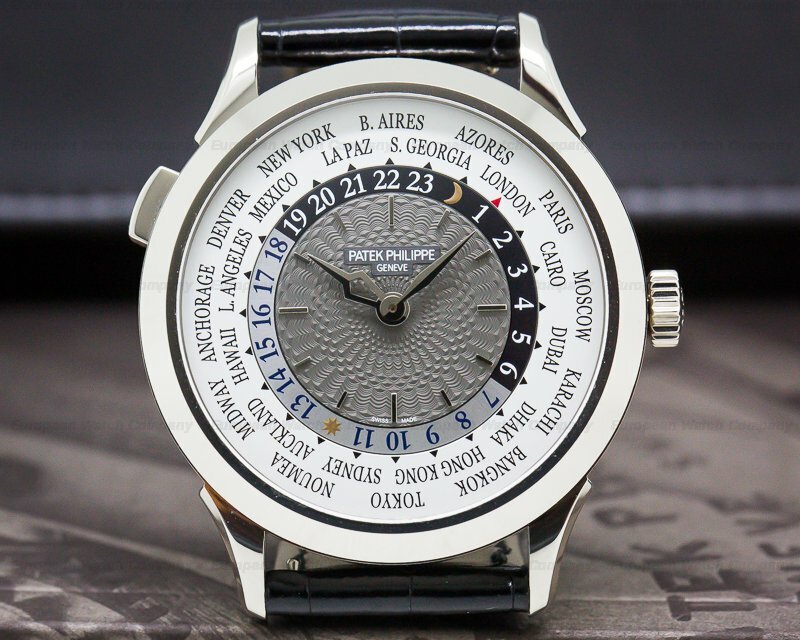 It has the Patek Philippe seal, and it's constructed with 35 jewels, 239 components, and a Gyromax® balance that's adjusted to heat, cold, isochronism, and 6 positions. 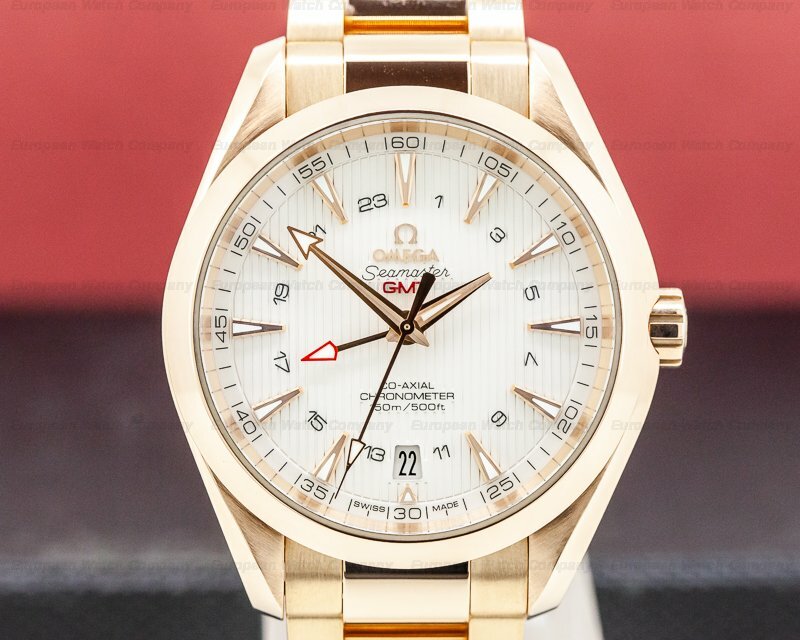 In includes a 22K gold off-center unidirectional winding mini-rotor with the Calatrava symbol, a shock absorber device, and a Spiromax® balance spring. 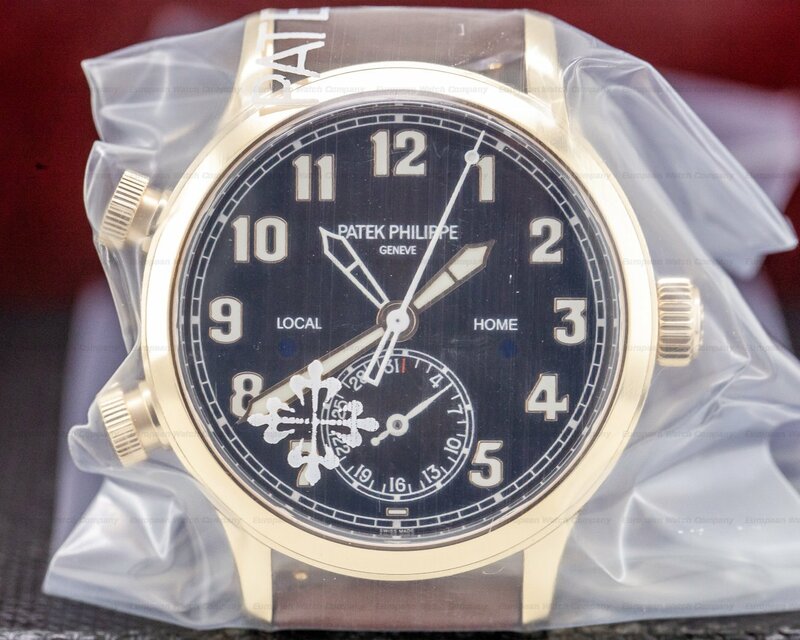 The mechanism oscillates at a frequency of 21,600 vph (3Hz). 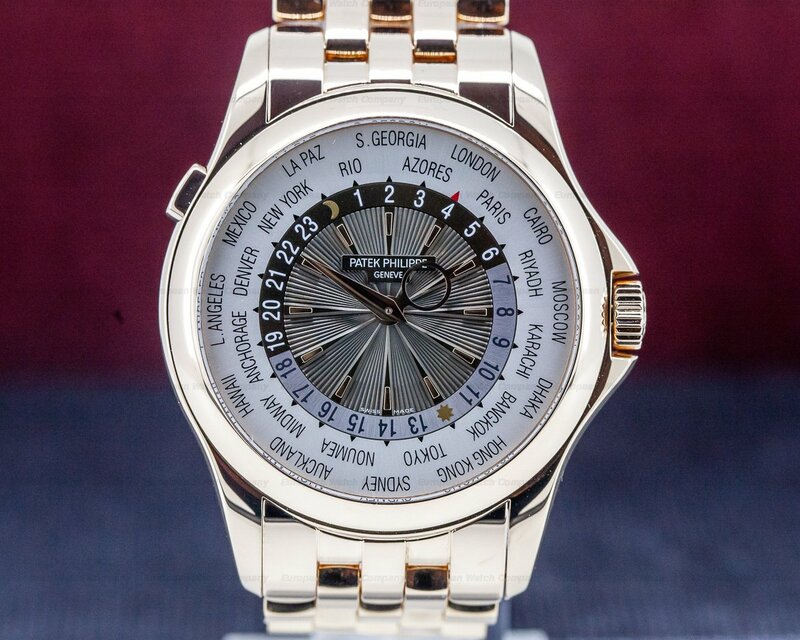 The Patek Philippe World Time 5230G-001 was introduced at BaselWorld in 2016.